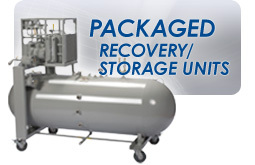 These compressors were specifically designed for applications involving the transfer and recovery of Chlorine. Railcar unloading is the most typical application although these compressors are also used in the recovery residual vapors, and pressure boosting. Corken's T-style design is incorporated in order to provide precise leakage control. Corken supplies custom engineered packages as well. Skid mounted units can be supplied with control panels, safety controls, receiver tanks, liquid traps, and other special accessories as required. Corken's Chlorine compressors provide a range of piston displacements from 8 to 35.5 cfm (13.6–60.3 m3/hr).